Today we are highlighting our first semi-guest post. This recipe comes from our occasional photographer extraordinaire/food taster Kevin (check out his web site here). You may remember seeing his contributions to the blog in our review of Battery Place Market where he took all of our photos. He has submitted to us a delicious looking Swedish meatball which uses the Venison (deer meat) left over from hunting season. We really enjoy the idea of using non traditional meats in our recipes and we plan to do more of this going forward. If your a hunter also, here is a new recipe to try. Pour the milk into a pot and set it on low heat. Cut the crusts off the stale bread and break it into pieces. Add it to the pot. It will begin to absorb the milk. When it does, turn off the heat and mash everything into a paste. Let it cool to room temperature. Mix the meat into a bowl, add the salt and spices. Crack the eggs into the bowl, then pour the bread-milk mixture in. Gently mix everything together gently. Gently roll the meatballs in the flour; you’ll probably need about a cup. When the meatballs are all made, get a large pan ready. Fill it with a little less than 1/4 inch of oil. I use canola oil with a little butter tossed in for flavor. Bring it up to temperature over medium-high heat. When a drop of water splashed in the oil immediately sizzles away, drop the heat to medium and add the meatballs. Do not crowd them. You want the oil to come up halfway on the meatballs. Add a little oil if need be; don’t worry, you can reuse the oil. Fry on medium heat for 3-5 minutes. You are looking for golden brown. Turn only once. The other side will need 2-4 minutes. 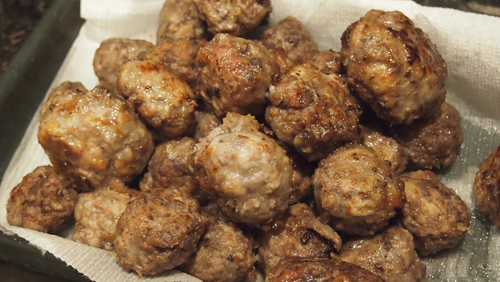 When cooked, set the meatballs on a paper towel or wire rack to drain. They can be used right away or cooled and then refrigerated for a week, or frozen for several months. 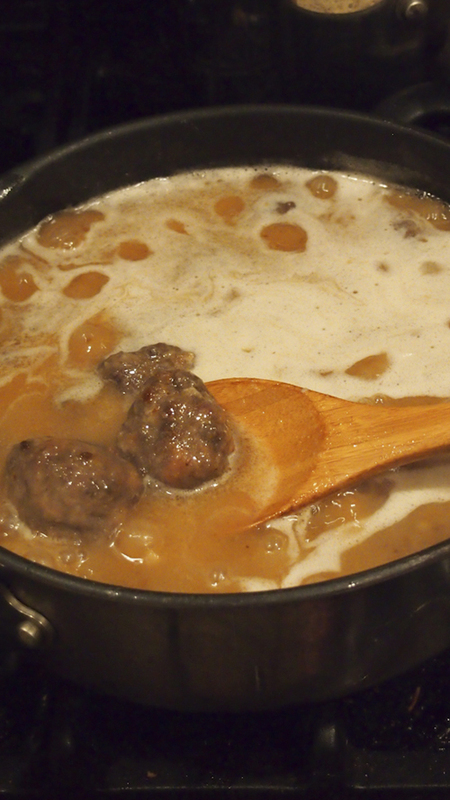 Once the meatballs are cooked, drain all but about 3-4 tablespoons of butter/oil from the pan. Over medium heat, add an equal amount of the flour left over from dusting the meatballs. Stir to make a roux and cook slowly until it turns a nice golden brown. Think coffee with cream. Add the stock gradually and turn the heat up to medium-high. Stir well to combine and add more stock or some water if need be — you want this thicker than water, thinner than Thanksgiving gravy. Taste for salt and add if needed. Put the meatballs in the pan, cover and cook for 10 minutes over medium-low heat. Add the lingonberry or highbush cranberry jelly to the pan. Let it melt and then mix it in gently. Coat all the meatballs with the sauce. Cover and cook another 10 minutes over very low heat. Add the cream and just warm through, maybe 3-4 minutes. Serve over mashed potatoes or with German egg noodles. After this past fall, we ended up with many different forms of Venison. Steaks, Sausages, Roasts, and of course ground venison. The problem with Venison is that it's such a lean meat, so it has very little fat to help bind the meat together. 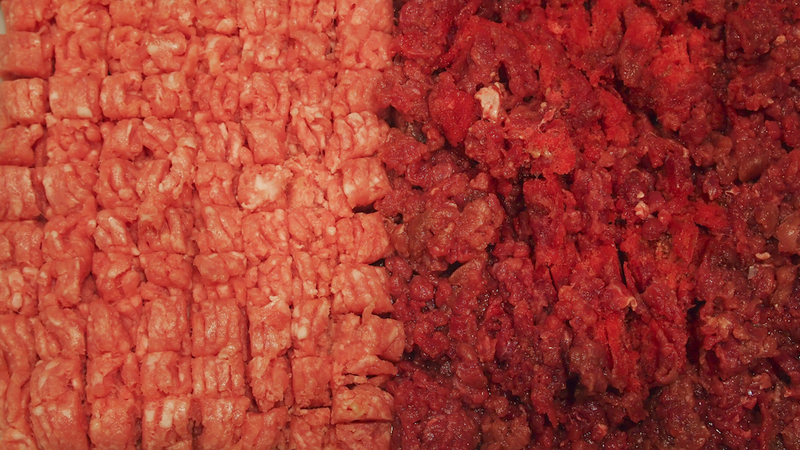 To help keep it all together and add a bit of flavor you have to add a fattier meat into the mix. That is where the pork comes in. Since I didn't have a meat grinder or food processor at the time, I was forced to chop up the two meats and hand mix everything together. 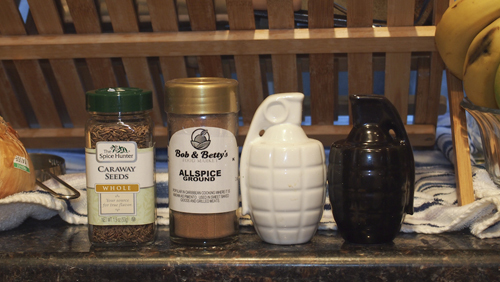 The only seasonings used were salt, pepper, Allspice (a Jamaican seasoning) and Caraway seeds. Once the meat was set, I needed to prepare the breading for the mixture. After heating up some milk, allow the chunks of stale bread to absorb it and create a soggy concoction. 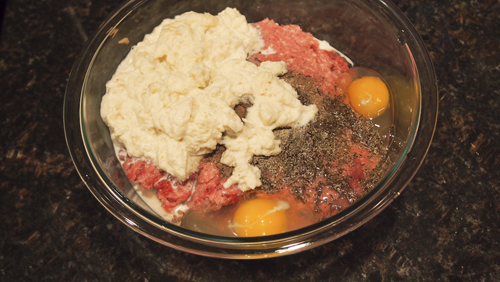 Once everything was set, the meat, spices, breading and two eggs are placed in a bowl and mixed well. Once finished, they are formed, rolled in flour, and placed into a pot to cook. After all the meat is cooked, you can then make the roux with some left over oil from the pot and left over flour from rolling. Beef Broth and whole cranberries were added to the sauce until it was a golden cream much like light and sweet coffee. The meatballs were then placed in the sauce and allowed to cook for a few more minutes until ready. 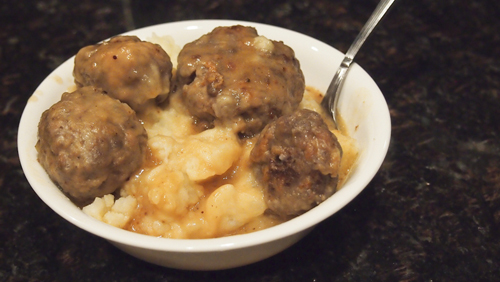 Served with homemade mashed potatoes, the meatballs came out very good. They were tender, flavorful, and no trace of the gamey taste you can get from a wild meat. If you have any leftover venison taking up room in the freezer, this recipe is a great way to make use of it. This may be a hard recipe to try since venison is not readily available at your local super market but this recipe is a Should Eat.